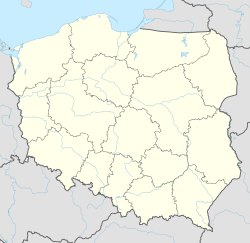 Korsze [ˈkɔrʂɛ] (German: Korschen, Lithuanian: Kuršiai) is a town in Kętrzyn County, Warmian-Masurian Voivodeship, Poland, with 4,724 inhabitants (2004). It is a railroad junction, located along the major Olsztyn - Skandawa - line, and Ełk-Bartoszyce line. Wikimedia Commons has media related to Korsze. This Kętrzyn County location article is a stub. You can help Wikipedia by expanding it. This page was last edited on 7 June 2018, at 17:32 (UTC).